SCOTTSDALE, Ariz. - Oct. 17, 2017 - PRLog -- Royse Contemporary is excited to announce Expression & Dialogue, the joint exhibition of Dan Pederson and Thuong Nguyen. This exciting exhibition will feature the mixed media assemblages of Dan Pederson and abstract paintings of Thuong Nguyen. 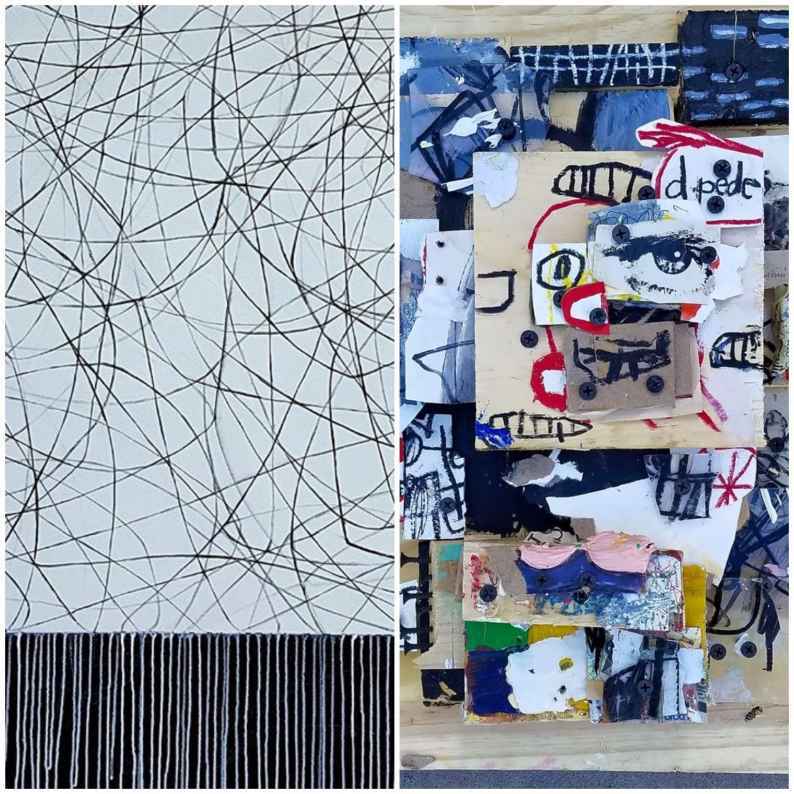 Expression & Dialogue highlights a thought-provoking collection of work from these two talented artists that may appear aesthetically different, but have an undeniable connection and energy that unites their work. Through the raw and expressive work of Pederson combined with the powerful dialogue of Nguyen paintings, this unique pairing of artists is stimulating yet harmonious, states owner and curator Nicole Royse. Nguyen has said that his feels his work reflects a "Dialogue that is represented by the usage of abstract brush strokes, forms, and lines, once incorporated, the works express my questions and concerns about humanity and nature." Pederson's work offers a modern simplicity that has a feeling of immediacy about it, he states "I use layers to help create new textures and movement, while I explore different ways to express myself, through traditional media, such as wood and canvas, as well as ephemeral media i.e. paper, found objects." East Valley based artist Dan Pederson creates engaging work that centers around "color, layers and the organization of clutter," he goes on to say, "I work in the moment, it's a flurry of energy, music and color, culminating with the euphoria of creation." Pederson received his Bachelors Degree in Music from Chapman College. He has exhibited his work extensively in Arizona at such venues as the Chartreuse Gallery, the Icehouse, the monOrchid, R. Pela Gallery, Tieken Gallery, and Art Intersection. His work has been featured in numerous publications including Phoenix New Times, AZ Foothills Magazine, AZCulture.com, Visual Art Source, and the Arizona Republic. Phoenix based artist Thuong Nguyen creates alluring paintings that draw inspiration from Asian landscape paintings that utilize black ink and brushstrokes much like calligraphy painting. Nguyen says that his "work reflects and draws from Zen Buddhist philosophy, as well as the beauty of the desert's wilderness." Nguyen is traditionally trained in the arts receiving a Bachelors of Fine Arts Degree in Sculpture from Arizona State University. He has actively exhibited his work around the valley showing with such venues as Art One Gallery, The monOrchid, Estrella Community College, Olney Gallery, Herberger Theater, and modified Arts, just to name a few. His work has been featured in numerous publications including New American Painting Magazine, Phoenix New Times, the Arts Beacon, Visual Art Source, and the Arizona Republic. The opening reception will take place Thursday, November 9, 2017 from 5-10pm coinciding with the weekly Thursday night Scottsdale ArtWalk in Old Town Scottsdale. The evening will feature a brief talk by owner and curator Nicole Royse addressing both artists and their work, along with an opportunity to meet the artists. Expression & Dialogue will be on view through Saturday, December 2, 2017. Royse Contemporary is located in the Marshall Square complex at 7077 E. Main Street, Suite 6, Scottsdale, AZ 85251 (located on the south side of Main Street just west of Marshall Way). Royse Contemporary is open Monday, Tuesday, Friday 10-2pm, Wednesday by appointment only, Thursday 5-10pm, Saturday 1-4pm, Sunday Closed. For more information about Royse Contemporary or for mentioned artists please visit roysecontemporary.com. Direct all media inquiries to owner, Nicole Royse Nicole@nicoleroyse.com or (602) 810-3449.